This is Z Life: John and Kyle Went to Sac, Had a Great Time, and Now They're Back! 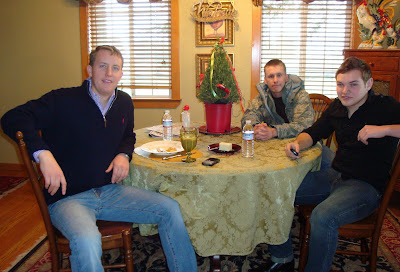 John and Kyle Went to Sac, Had a Great Time, and Now They're Back! 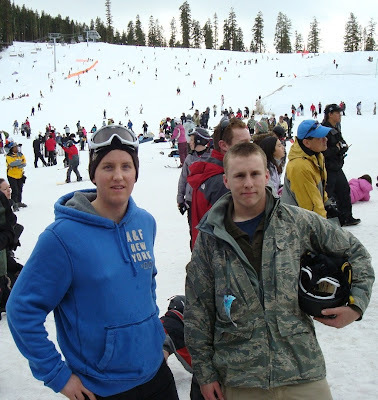 On December 30th, John and Kyle D. headed out to the great state of California. Kyle has a girlfriend there, whom he met at PEAK last year, and he invited John along. They were both pretty excited about the trip. Lisa and Tony C. put them up in their guest house. Thank you so much, Lisa, for all you did for these guys. They both appreciate the hospitality you, Tony, and your Kyle showed them. Thank you, too, for the pictures! As far as I know, they are the only ones John has of his trip. 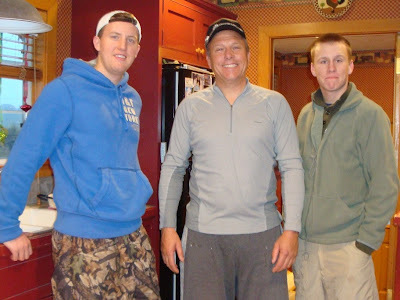 .John, Kyle C., and Kyle D.
One of the highlights of the trip for John was going skiing. We don't get to do that here in the deep south. Tony and Kyle C. took him to Lake Tahoe, and he had "an awesome day." Other highlights of the trip, at least for John, were being in service at TheRock Church, playing flag football with the guys there, and visiting San Francisco. Thanks to Clayton W. for introducing John around. He said he met lots of nice people and made some new friends. The welcome mat will always be out for you nice California folks. Ya'll come!